Scenario: – We have created new Test with the name “blog” and let us observe the folder structure created by UFT. 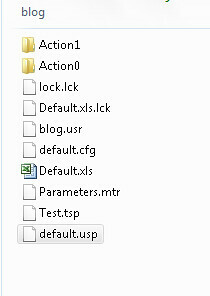 On creating of new GUI Test in UFT, by default two actions (Action0, Action1) is created. Action1:– It contains details about our first Action and is visible in “Editor” (Keyword view of QTP) of UFT. Snapshots:-It contains all the snapshots taken during recording of the AUT.It is used when recorded screens are displayed in “Active Screen” in UFT. Resource.mtr:-Binary file containing the information for the I/O Parameters of the action. Script.mts:-Most important of, this file contains the UFT code. Action0:– it is like storehouse having settings which are applicable to all the actions present in the Test. For instance, “Number of iterations”, “Call to Existing action”. Lock.lck:-It comes into play, when Test is already opened and it locks the resources of test, such that when we try to access same Test in another instance of UFT , test loads in “Read Only” mode . Thus it solves the concurrency problem, by blocking other user from modifying the already opened test. It has information such as Username, Computer Name and Date details when changes are made to Test. Default.xls:– Excel file, containing the complete Datatable data.By default it will have two sheets. (Global,Action1).To play with this, open this file, add and save data to “Global” sheet and load the Test again in UFT, added data will reflect in Datatable of UFT “Global” sheet. Test.tsp:-It is a binary test settings file, contains UFT test settings.